Quite a different day dawned on Thursday, after our sunny evening in the cockpit on Wednesday, but although it was cool and overcast, it was not actually raining. An important objective in sailing to Gweek was to visit the seal sanctuary, which (along with a pub lunch) took up most of the day. This still gave us an hours snooze before the tide (the biggest spring tide of the cycle) lifted us off the mud. 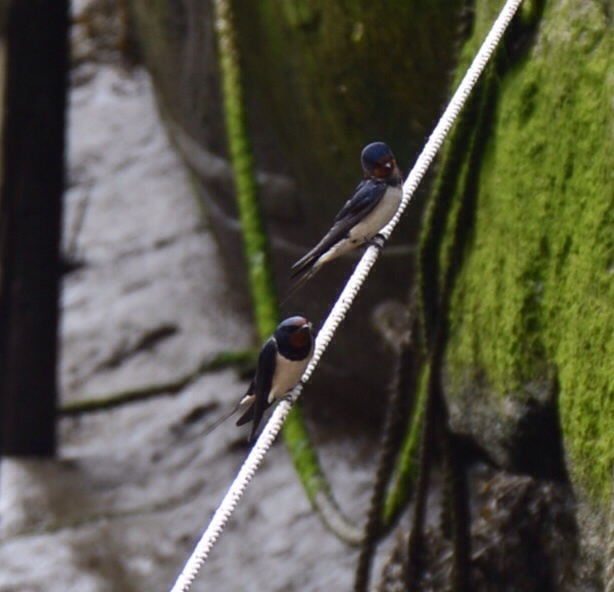 Here’s a photo of a pair of swallows resting on our warp. 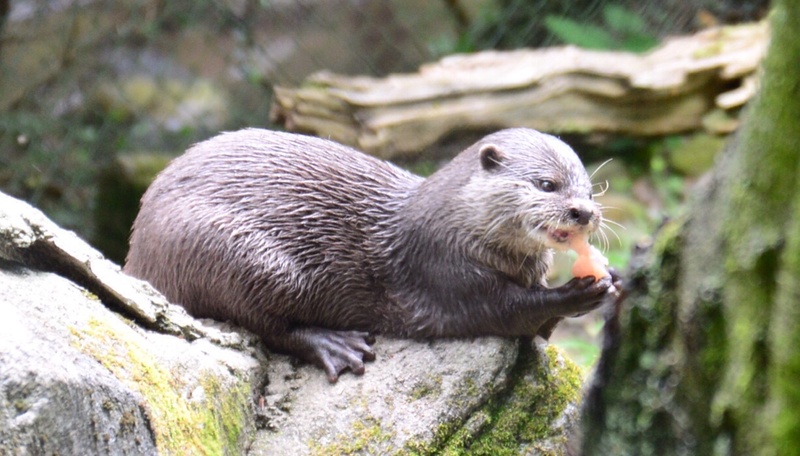 An Asian Short Clawed Otter at the Seal sanctuary. 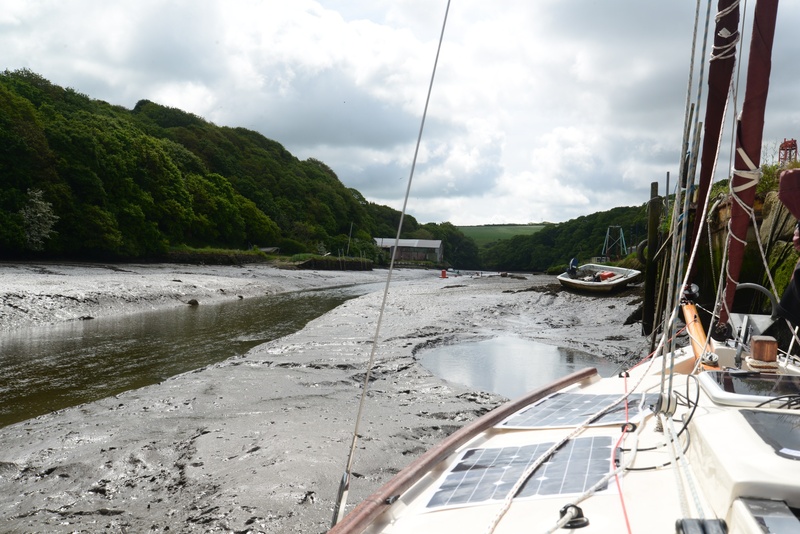 Gweek Quay at low tide. 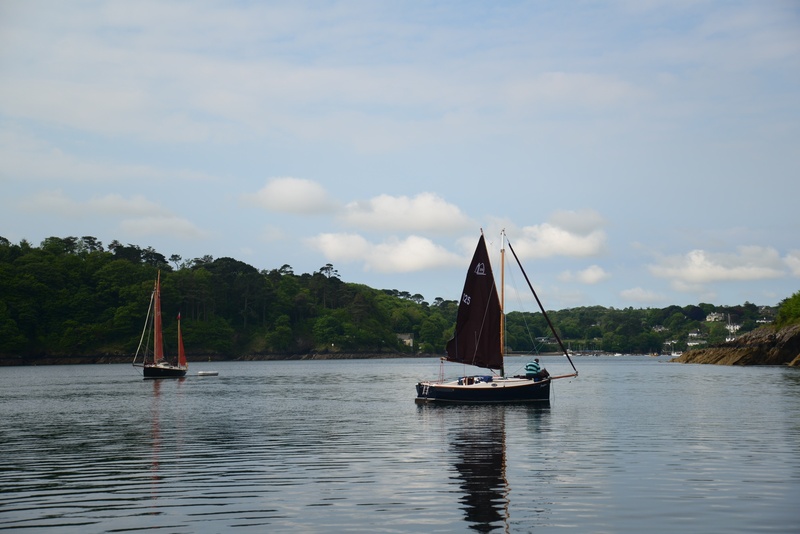 We were soon motoring down the Helford, past Tremayne Quay and on to the first of the moorings. Though I set the main and staysail, the wind was so confused along the river valley that they gave no more than an occasional shove. However, as soon as the mouth of the river opened up, the wind settled to a NE and it was a reach towards the buoy for August Rock and the we hardened up towards Zone Point. The breeze filled in nicely and, with all three sails out, we made fantastic time; the GPS barely dipped below 5kts for the whole run across the bay. 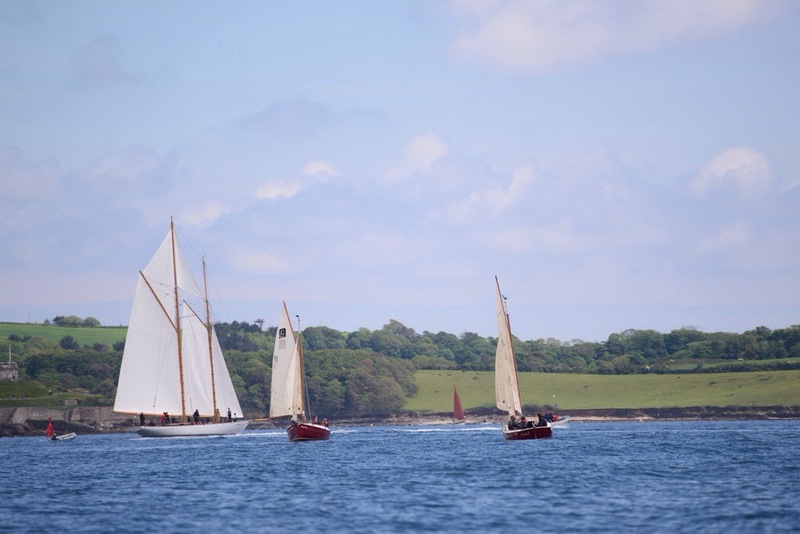 Given the wind direction, we decided to anchor at St Mawes and had to pick our way around the evening race, which included boats from small dinghies to full size yachts. Finally, we dropped anchor near the harbour wall and enjoyed a pastie and a slice of cake in the cockpit, before retiring to the cabin. Today, we took a day out of the International Cape Cutter Week to spend time with friends. 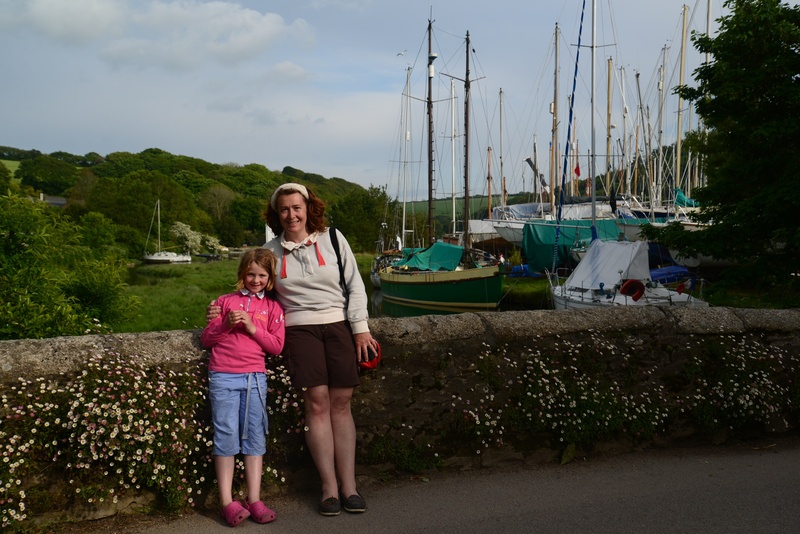 Having anchored overnight in the Helford River at Robin’s Cove, we bid farewell for now to Sapphire and Lucy, as they poked their noses up to Frenchman’s Creek and then turned back to return to Mylor. 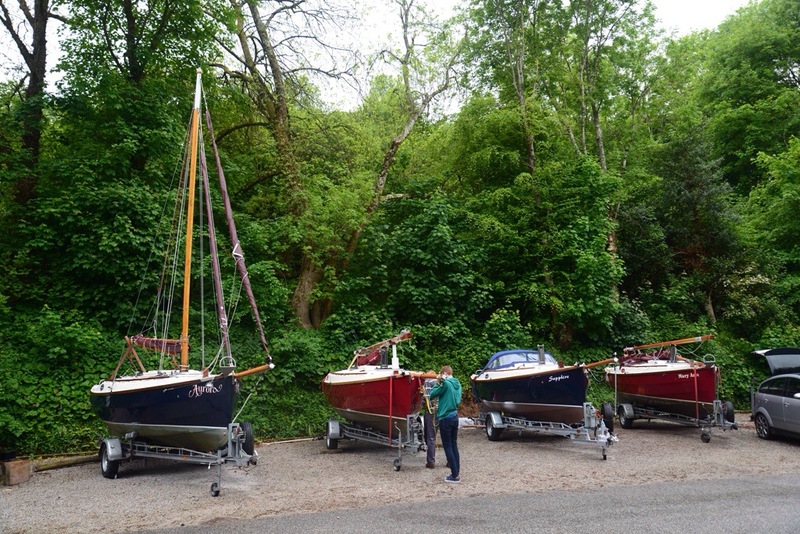 We moved to anchor off Durgan beach to await our friends and there was time for some housekeeping. We checked the “sea life cage” (not a lobster pot, because we’ve caught no lobsters) and found a shore crab (as always) and an eel (immediately christened Eric by Alice). Having released our catch, I then did some DIY, drilling fixing points on the new solar panels and changing from a traditional sail tie to fixed shock-cord-and-hook system or securing the mainsail. The latter proved very successful and was an idea I had “borrowed” from Dennis on Mary Ann (who had, in turn learned the idea from the Drascombes). Quite soon it was time to pick the newcomers from the beach and deposit Aimee in exchange. 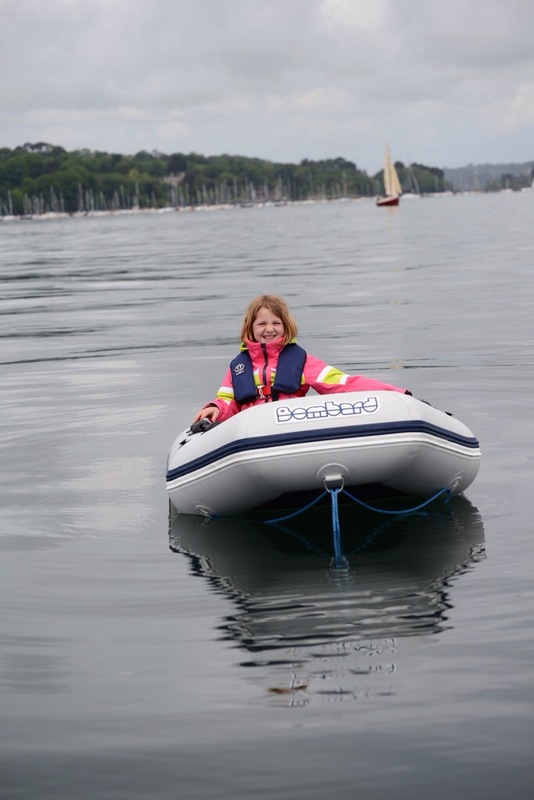 The plan was for Ben And Zack, having dropped off Sally and Pip, to take Aimee by car back to Mylor and then sail to meet us on their Dart. Meanwhile, the rest of us sailed in Aurora up to Tremayne Quay. We had to stop there, as this was where the water ran out. We did actually run aground just before we got there, but the oyster fishermen soon helped us off. With time to kill, we rowed ashore and had a lovely walk in the beautiful woods. The upper part of the. 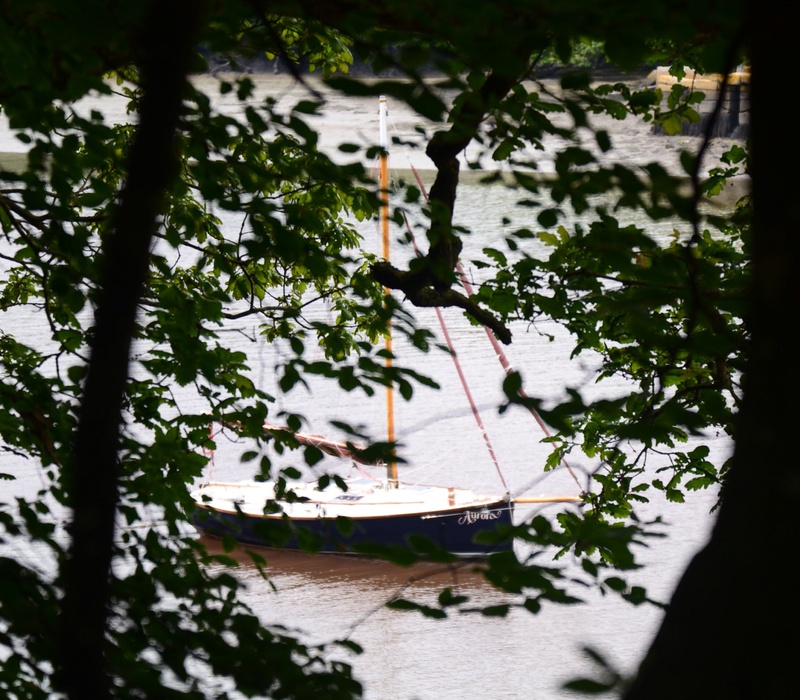 Helford River is especially lovely because oak woodland reaches right down to the water line and there area is stuffed with wildlife. 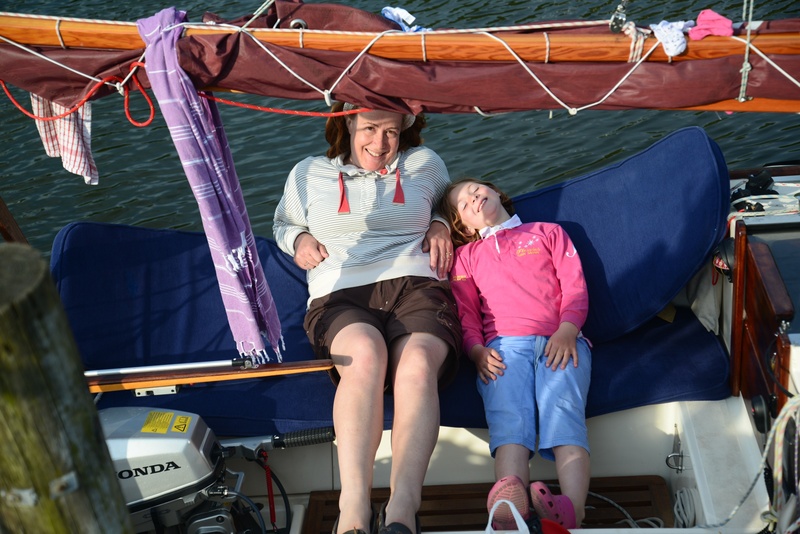 We met some “Swallows and Amazons” camping on the quay, having rowed down from our target, Gweek, so they were able to give us some local pilotage. We then explored on foot to the source of the “Nile” (well the top of the creek, anyway). By the time we returned to the quay, Ben and the Dart were in sight. However, when I went to get the tender, I was in for a shock, because it was just floating away! I thought I had left it well above the expected water line, but had seriously underestimated that. 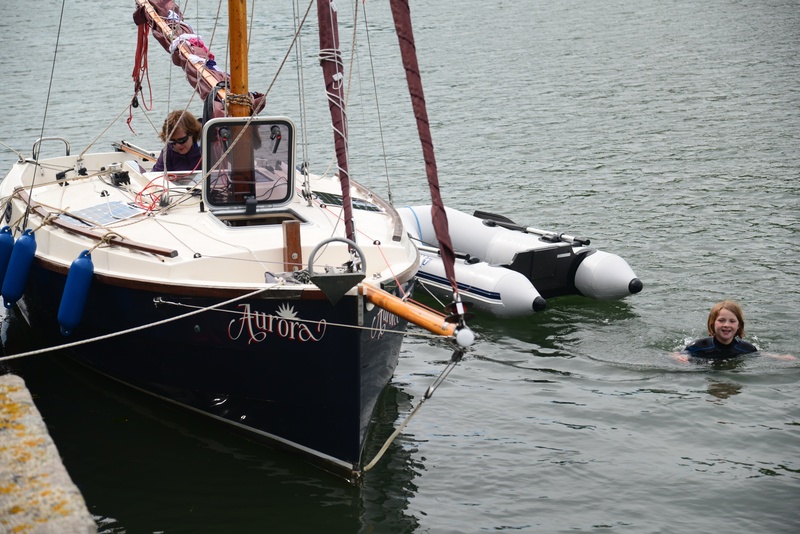 Anyway, after an unscheduled swim, the dinghy was retrieved and Aurora brought alongside Tremayne Quay for afternoon tea. I don’t think that was as grand as the intended use of the Quay, which was originally built for Queen Victoria (though she did not visit it!). 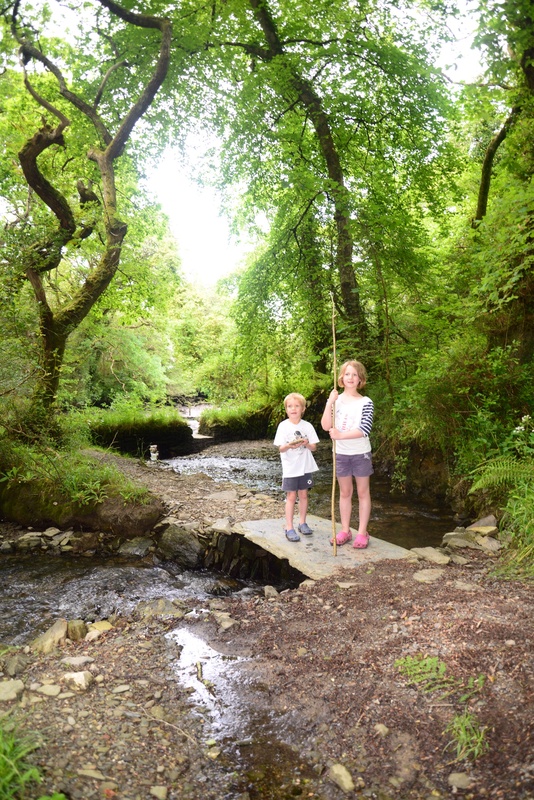 With four step covered with water, it was time to trickle up river with trusty beanpole to find the top of the Helford. 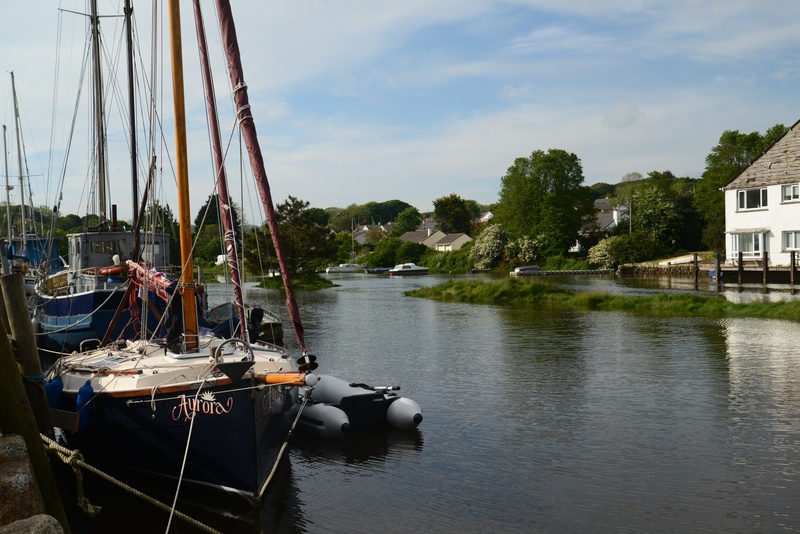 The trip was very pleasant indeed and was well buoyed all the way to the quay at Gweek. There was a helpful couple who helped us to tie up against the wall; however, we did. to have long to bask in the sun, as we had to bid farewell to Sally and Pip, who returned to Falmouth on the bus. Whilst our pork casserole finished itself in the thermal cooker, we strolled through the village. It turned out to be an evening for supper on the green with a large crowd enjoying fresh fish and chips from the van. We did not participate, as our dinner awaited us on board, but we did enjoy a pint outside the Swan in the sun. Altogether a very pleasant day. Tomorrow, we plan to spend the day here and visit the seal sanctuary, and return in the evening when the tide has lifted Aurora back off the mud. The forecast was not entirely accurate for today and there was less wind and more rain than forecast. Still, today was a special day: there would be no less than five Cape Cutters sailing together (with Cornish Yawl, Lucy, aka “The Mothership”). 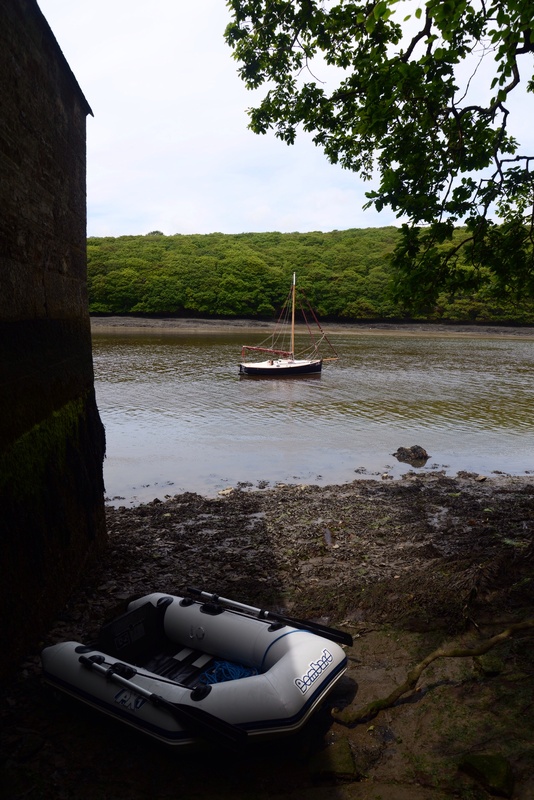 After a quick discussion, we decided to head down the Fal and aim for the Helford river. The rain cleared up, but there was still little wind and we ended up basking opposite St Just for a while before we started engines and motored down to the mouth of the Fal. 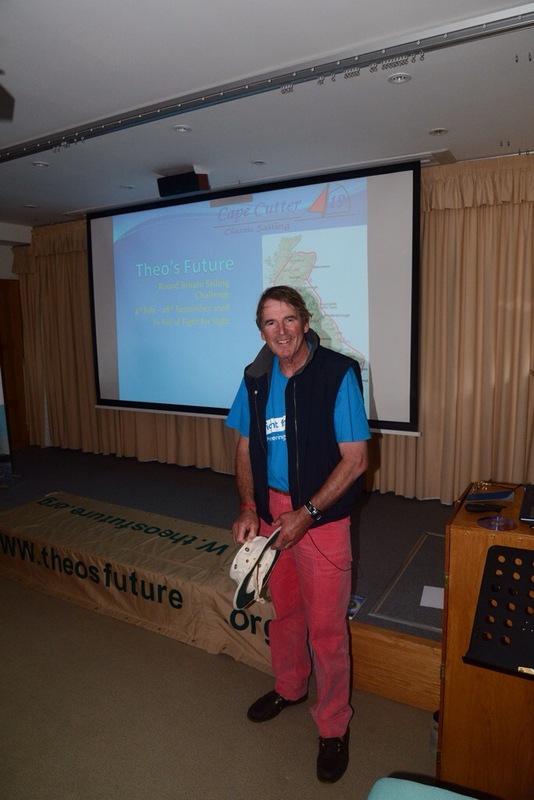 We were due back early for a talk from Cape Cutter Association president, Mike Brooke (who was sailing aboard the newest Cape Cutter, Sapphire, and no doubt passing on some of his long experience with this boat), about his charity fund raising sail around Britain in a Cape Cutter. As a result, we decided to do a turn around Black Rock and then head into Falmouth for lunch. This we duly did and all rafted to Lucy in front of Town Quay. 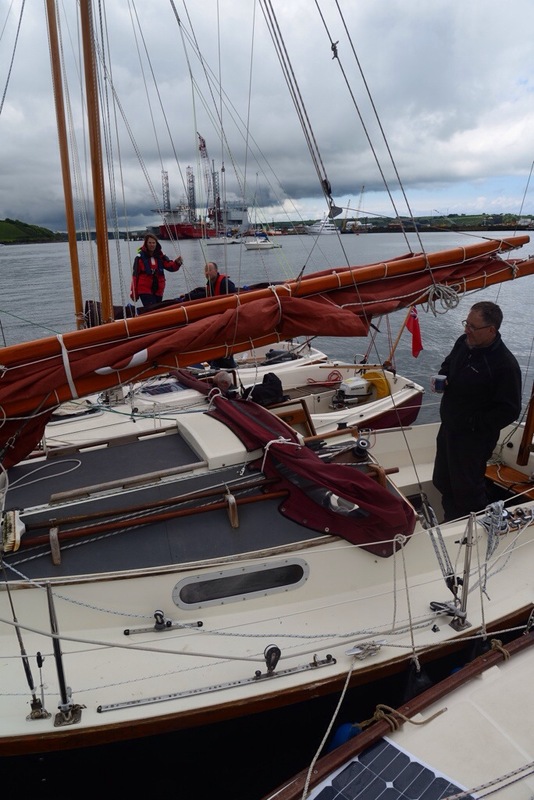 The darkening skies were our signal to move off and we motored back to Mylor in the rain. Despite the rather low key sailing (and weather), it was a most enjoyable day, being a chance to swap notes and sail in company of other Cape Cutters. With an improving forecast for the week, we went to Mike’s very entertaining talk about his round-Britain sail which has raised so much money to find life-changing research to help children with inherited blindness. It was an early start for us on Saturday; Aurora was hitched and ready to go the night before, so we jumped in the van and were on the road shortly after 4.30. This paid off because we managed to avoid the holiday traffic and arrived at Mylor before 10am. 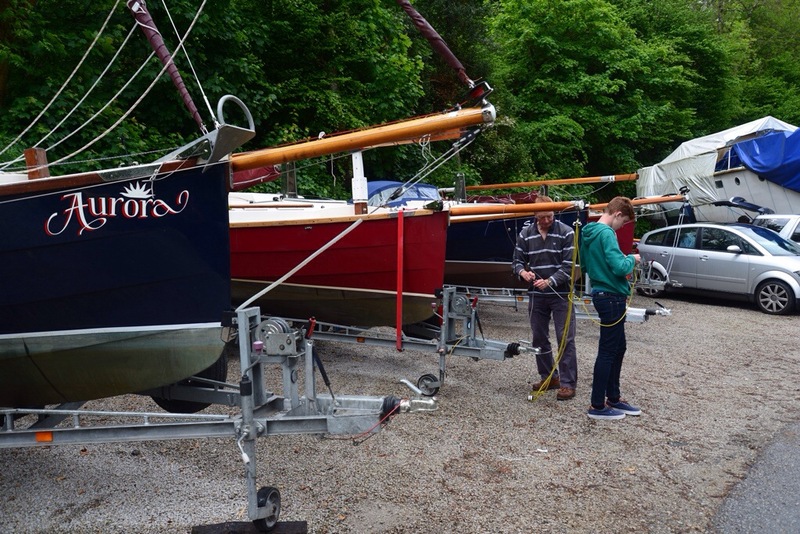 It took slightly longer than usual to rig because I had varnished the boom, gaff and bowsprit, so they needed some checking, but we were mostly rigged before the other boats started arriving. It was lovely to finally have a group of Cape Cutters together and we were soon swapping notes on our boats and helping each other to rig up. For Sapphire, it was a first rig and the first time she had been in the water. 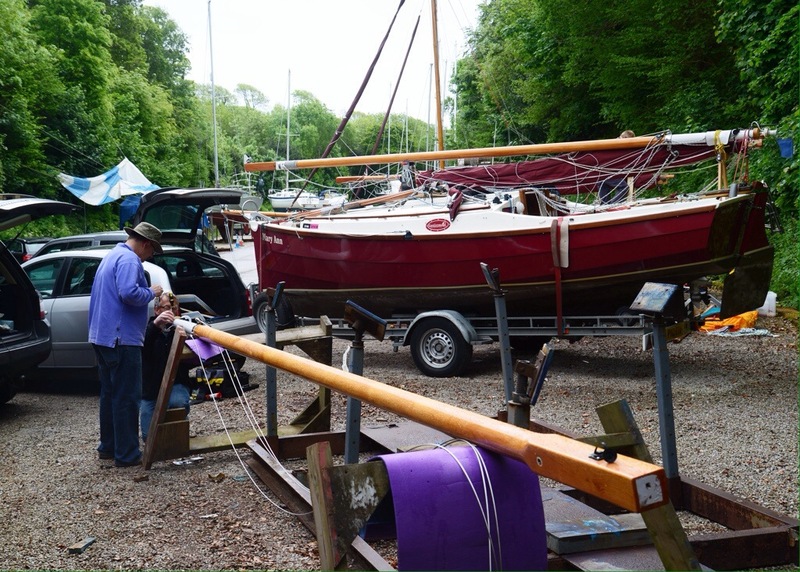 It was interesting to see how a brand new boat arrives- it comes with a bog box of ropes and another of blocks and shackles. Fortunately they are all neatly labelled with luggage tags. 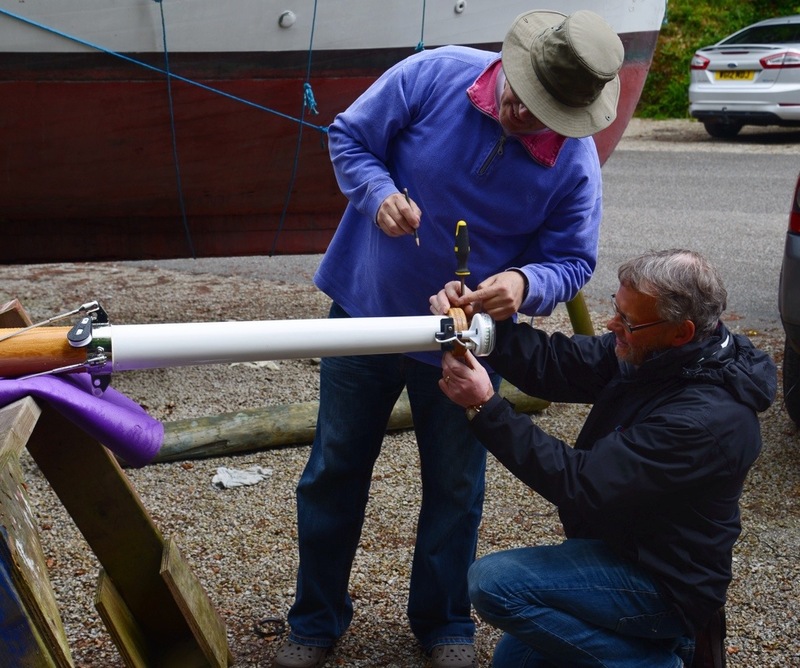 However, on the downside, there was a fitting missing on the mast, so some extra attention was needed. After a textbook launch, time was getting on, so we decided to have an early night, and finished the day with a pontoon barbecue. Looking forward to four or even five Cape Cutters sailing together.